Having tried Photo Booth on Mac OS X, I once wished to have that cool application on my Linux box. 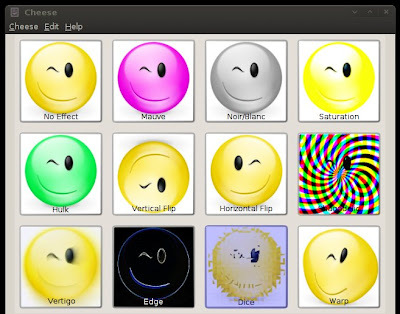 Then came Cheese, the GNOME application that is quite similar to that of Photo Booth. Utilizing GStreamer framework, it allows users to apply fantastic graphical effects while capturing photos or videos. Aside from the fun stuff, Cheese is loaded with handy little features. I installed the latest version of Cheese, which is 2.26.0 on Ubuntu 9.04, and it works like a charm with my A4Tech (PK-730MJ) webcam. Cheese is available in all major distro repositories so Linux users should have no problem getting and installing it. Cheese has a very simple and a no-nonsense graphical interface. If you want to take a photo, just click on the "Photo" button, then "Take a Photo". If you want to take a video, click on the “Video” button, then "Start/Stop Recording". You will see snapshots of the captured images and videos at the bottom where you can view them by double-clicking. By default, the captured images are saved at /home/username/Pictures/Webcam, while videos are saved at /home/username/Videos/Webcam. You can also combine those effects by picking two or more of them, and then clicking on the "Effects" button to start recording videos or capturing photos with multiple effects. Another good feature of Cheese is that it supports uploading of photos on Flickr provided that you have the "postr" package installed. All in all, Cheese is a handy webcam application that should be installed by default on Ubuntu and on other popular distros because I can't think of any other webcam software for Linux that can rival even the basic functionality of Cheese. Although it will not turn your ordinary webcam into a security camera, it's very reliable, user-friendly, and it can be a lot of fun. I just hope that more fancy effects and useful features will be added to Cheese soon. So what can you say about Cheese? 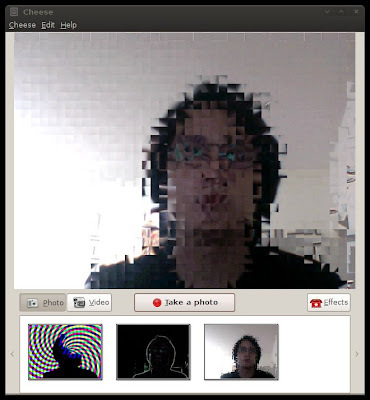 Do you know of other webcam software for Linux that is better or is as good as Cheese? Nobody in my part of the world has a webcam, that may be the reason why it's not installed by default. I Like it, it works great, but is there a program that works with skype to allow for use of the special effects while on line?